During the warmer weathered months (we’re talking about spring and summer!) 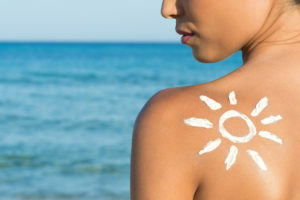 your beauty routine will need extra care to avoid the harsh elements of the sun, sand, and surf. Especially if you plan on traveling or going out where the sun’s harmful UV rays are apparent, you’ll need to stay protected. Here are our best beauty tips for your hair, skin, and nails this year. Salon stylists recommend that first and foremost you get a trim because hair grows faster in the late spring and summer months compared to winter. Avoid the hassle of split ends, fried locks, and damaged hair with a fresh new cut. In fact, hairdressers advise trimming your hair every three months. Sound like a lot? Your hair will thank you in the long run. Another pro-stylist tip is to avoid getting any dramatic hair color changes during the summer. Even if you’re dying (pun intended) to change your hair color up, avoid risking your style. Highlights and other small changes are acceptable but major dyes can fade due to wind, sun, salt, and chlorine. Ask your hairdresser for an indulgent oil mask or other moisturizing hair treatments to refresh damaged hair and add a revitalizing healthful glow to your strands. Thick humidity causes frizz—one of the biggest problems that will prevent you from having the luscious hair you crave, so combat this with healthy and well-maintained hair and change up your hairstyle to a simple up-do. Just as your skin can burn in the sun, so can your hair and scalp. Apply a hair care product containing UV filters to protect against sun damage and prevent hair-color fading. When the weather gets hotter, you’ll be tempted to take a dip in the pool or ocean. Unfortunately chlorine, salt, and other chemicals are extremely drying for hair. Stylists recommend saturating strands before heading to the pool or ocean. If your hair is already wet with clean water or leave-in conditioner, it will be less likely to absorb salt or chemicals. Ask your salon to prescribe a moisturizing shampoo and conditioner tailored to your hair and scalp needs. Summer equals more sweat, which will tempt you to wash your hair more and strip your hair of natural oils. Lastly, excessive blow-drying and heat styling tools will only hurt your hair even more so limit usage of any hot tools. One of the most known tips for the hotter months is the no-brainer: keep skin protected with a moisturizer containing SPF. Some makeup products like face powder even contain SPF to matte-ify your makeup but also keep your skin safe. Beyond that, though, advice can help your skin beat the summer heat. Keep a face mist to cool your face and body if you’re headed on vacation. Not only will it cool you off, but also many sprays contain special formulas that can aid skin. Ask your spa for exfoliating services to get rid of dry skin. Dermatologists recommend focusing on missed areas like knees and elbows and to finish off with a moisturizing cream or oil afterwards. Breakouts and acne tend to make an appearance when your face gets sweaty so be sure to stay on top of your skincare routine. Try a glycolic mask or a salicylic acid peel once a week and use oil blotting sheets daily to keep oil off your face. Use oil-free sunscreens too. When you break out the sandals and short sleeves, there’s no doubt that you’ll want a good manicure and pedicure to show off. Normal polishes run the risk of chipping, ruining a fresh mani or pedi so think about your alternative. Instead, gel polish is the new trend that lasts longer, extends the time of your polish, and resists chipping. Curated with a UV or LED light, these polishes offer a brilliant and long lasting shine. Gel manicures also last longer in water when you’re swimming in the pool or splashing at the beach. Don’t forget to protect your hands too! Slather on SPF and moisturizing lotions on the thin skin of your hands. Try cuticle oils or cream to keep your nail beds hydrated as well. Communicating with your manicurist is crucial for well polished hands and feet.